Rock Lee is Might Guy's favorite student. Lee is very dedicated to Guy, modeling his appearance and many of his habits after Guy's. One such trait is his unwillingness to give up, always being optimistic and confident that he can complete a task. This has resulted in his personal goals in life being to defeat a "genius" such as Neji Hyuga and to make Sakura Haruno his girlfriend. While Lee puts a great deal of effort into accomplishing each goal during the Chunin Exam arc, his appearances in later arcs see little to no attempts to make either a reality. Independent of Guy's influence, Lee is very respectful, never using contractions and always applying proper titles ("-san", "-kun", etc.) to anyone he meets. He is likewise very honorable, never holding a grudge and always treating his opponents with great respect. Lee is unable to use ninjutsu or genjutsu. As a result, Lee's dream is to become a splendid ninja by using only taijutsu. Through Guy's mentorship, Lee has become very proficient with taijutsu, mastering the Strong Fist style of combat and being able to open the first five of the eight chakra gates. Because of the danger these abilities can pose to those around him and even to his own body, Lee is only permitted to use some of the stronger attributes of these techniques to protect something or someone dear to him. While Lee's training has made him a formidable opponent, he is a natural-born user of the Drunken Fist. Should he drink as little as one drop of alcohol, he becomes an unpredictable source of inebriated destruction. His actions while drunk are usually a combination of misguided attempts to impress Guy, regardless of whether or not Guy is around, and he drunkedly attacks any friend or foe that is near him. His alcoholic lapses are relatively brief, and he has no memory of his actions once he has returned to his normal self. Since he can only use taijutsu, when he needs to run fast he removes the weights attached to his ankles so he can match, and often surpass, the speed of his teammates and opponents. Return from About Rock Lee to How To Draw Sakura Haruno. 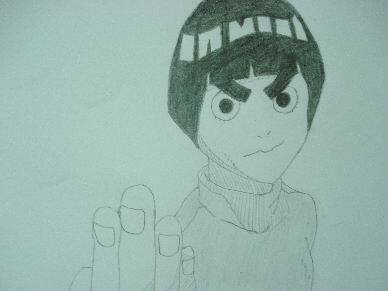 Return from About Rock Lee to How To Draw Naruto. Learn how to draw Sakura Haruno, Naruto Characters. Learn more on How to draw cartoon characters. Vote for your favorite Naruto anime characters that you would like to draw.